I started using VFX layout which was made by Windows Layout Wizard automatically like 1y ago, everything was fine except flickering, thats why I started manual VFX Layout setup. I have no issues, when I'm playing on 1pc, I need to press just 1 time to change current window even w/o "Focus game windows via mouse" enabled. But I have some weird issues when I'm using multiple pc. I tried a lot of combos to solve it, but no success at all. When I'm launching char set, it launch games normally, but one of the pc's don't want to return to Slot1 windows, that's why it don't create vfx layout. To create layout, I need to jump on slot1, another slot, again slot1, but after that to swap window I need to do double click on each window. Sometimes this happens on both pc's. 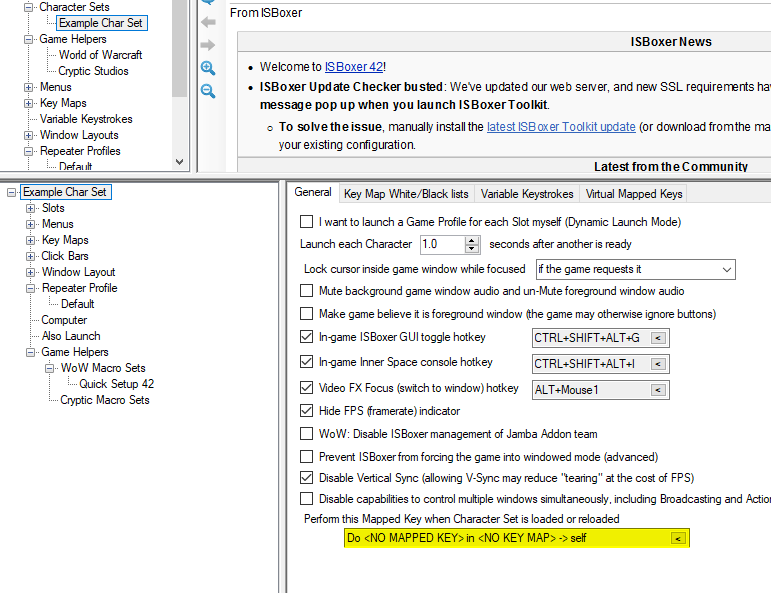 To fix issues with going to slot1 after load, I can use "Swap Hot Character to main region", however, this wont execute Slot Swap key, which creates layout and not solving issue with double clicking. Atm, I'm using hybrid, main pc have manual vfx layout, while 2nd one, sits on vfx from windows layout wizard, this works fine, but I want to get rid of flickering everywhere. Also, when I'm assign, dxnothing from wizard layout to layout with manual vfx region, It destroy Swap to slot1 right after char set loaded as well. I thought that all issues came from my old profile, so I made clean one, no success as well. If you want the videofx layout to create straight away on team load, then set a mapped key to execute when the Character Set is loaded/reloaded. For your DXNothing character, set the Game Type dropdown to be Other, and not DXNothing. Slightly counter intuitive, but there are reasons in that the DXNothing type has special handling which is for a Wizard generated layout, not a custom layout. While there, I would probably also untick the Ignore keyboard/mouse broadcasts option, as this might interfere with the Focus Follows Mouse on the Window Layout (conjecture, and completely unlikely, but I can't see anything else). 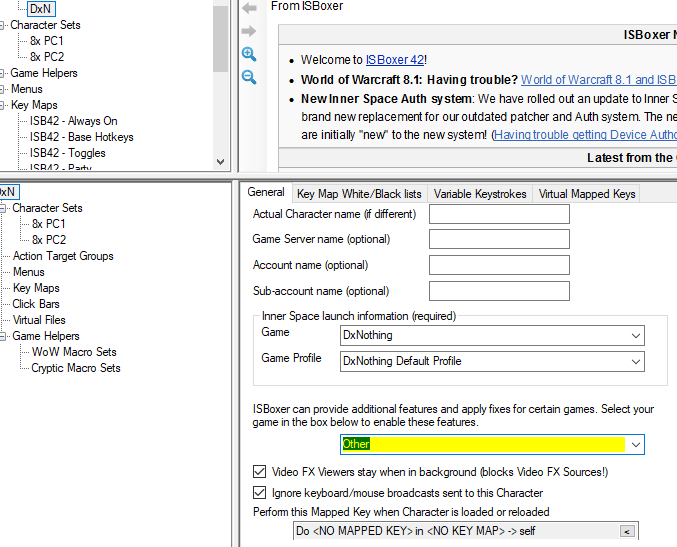 If you want to exclude broadcasts and such, adjust the Target of the mapped keys to exclude this character. Failing that, get a compatibility diagnostic. Any running game is find launched under ISBoxer or not (in fact under ISBoxer is probably better at this point). bob wrote: If you want the videofx layout to create straight away on team load, then set a mapped key to execute when the Character Set is loaded/reloaded. Ofc, I know about this feature, but I don't need to use, cause innerspace after char set load must place region1 on top (which is happen on just 1 pc now for some reason). I tried DxNothing -> Other, also, ignore keys, allow them and so many other things. Nothing helped me, but ok, I'll try to get some Diagonstics info.